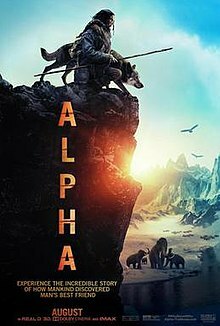 Alpha is a 2018 American historical adventure film directed by Albert Hughes and written by Daniele Sebastian Wiedenhaupt, from a story by Hughes. The film stars Kodi Smit-McPhee as a young hunter who befriends an injured wolf during the last ice age, with Jóhannes Haukur Jóhannesson as his father. The wolf is played by Chuck, a five-year-old Czechoslovakian Wolfdog. Principal photography began in February 2016 in Canada and lasted through that April. The film was delayed several times, before being released in the United States on August 17, 2018, by Sony Pictures Releasing. It has grossed over $99 million worldwide and received generally favorable reviews from critics, who praised the performances and cinematography. Plot: In Upper Paleolithic Europe, 20,000 years in the past, a small tribe of hunter-gatherers prepares for an expedition to hunt for the coming winter's food. Tau, its chief, trains his adolescent son Keda, accepting him and another boy to join the hunting party. His wife Rho worries that Keda is not ready, but Tau believes he is and the hunters set out. Tau tests Keda by having him kill a boar they've caught, but Keda balks. One night, the party's fire draws the attention of a Machairodus saber-toothed cat, which lunges through their circle, snatching Keda's friend. Hearing the fatal struggle in the darkness, the tribe gives him up for dead. The member is given a memorial service in the form of placing rocks to symbolize the passing of one's spirit to the afterlife. The hunters eventually reach a herd of steppe bison, which they attempt to stampede off a cliff in relative success. Amidst the chaos, a bison rushes Keda and throws him over the edge, leaving him gripping the rough cliff edge with his hand. Keda loses grip and falls to a further ledge where he appears to break his leg and is knocked to unconsciousness. Tau attempts to climb down to him, but he is stopped by another member of the tribe who assures him in good faith that Keda is dead and there would be no way to reach him nonetheless. The tribe leaves and Tau performs another funeral ritual, stricken with grief. Keda awakes and tries to climb the rest of the way down the cliff. A sudden heavy rainfall causes the ravine below to flood. Losing his grip, Keda jumps into the water. He survives and splints his injured foot before returning to the top of the cliff. Seeing the memorial cairn left by his tribe, he realizes he must trek back to the village by himself. He is attacked by a pack of wolves, but escapes up a tree, wounding one of them which the others leave behind. Keda takes pity on it and cares for its injury. Gradually gaining the wolf's trust, he gives it water and then food, establishing himself as dominant by feeding himself first. He sets out for the village without the wolf, but it follows him. Their companionship grows, and they learn to hunt small boar together. Along the way, Keda names the wolf Alpha. One night, they are approached menacingly by a pack of wolves. They hesitate upon seeing Alpha, who steps forward and greets them. The pack runs off and with Keda's blessing, Alpha joins them. Keda continues his journey alone as the season changes to winter. On a frozen lake, he encounters a pack of wolves feeding. Recognizing Alpha, he runs to them, but the ice breaks and he falls through. Alpha helps rescue him and they are reunited. Continuing the journey together, they find a man who has frozen to death outside his tent and scavenge a bow and arrow from it. Later, they take refuge from cave hyenas in a cave where they are attacked by the same Machairodus that killed Keda's friend. Alpha and the Machairodus fight, and Keda kills the Machairodus with the arrow. However, Alpha is badly injured and now travels with difficulty. Meanwhile, Keda begins to cough up blood. When Alpha finally cannot walk, Keda carries the wolf. Keda eventually finds the village and reunites happily with his parents, who are amazed and proud of him. As the village healer tends to Alpha's wounds, the wolf delivers a litter of pups to Keda's surprise. Alpha and her pups are formally welcomed into the tribe and grow up in the care of Alpha and Keda. In time, the tribe becomes one of both humans and domesticated wolves, hunting together.